This oh-so-simple recipe is a great way to get the family involved. Set out the fajita toppings and let each family member assemble and top their own fajita. Score steak on both sides with shallow cross-cuts; place in shallow dish. Pour 1/2 cup marinade over steak; turn to evenly coat both sides of steak. Refrigerate 4 hours to marinate. Heat barbecue to medium-high heat. Remove steak from marinade; discard marinade. Grill steak 6 to 8 min. on each side or until medium doneness, brushing with remaining marinade for the last few minutes. Remove steak from barbecue. Let stand 5 min. Meanwhile, warm tortillas as directed on package. Cut steak across the grain into thin slices. Serve on tortillas with lettuce and cheese. 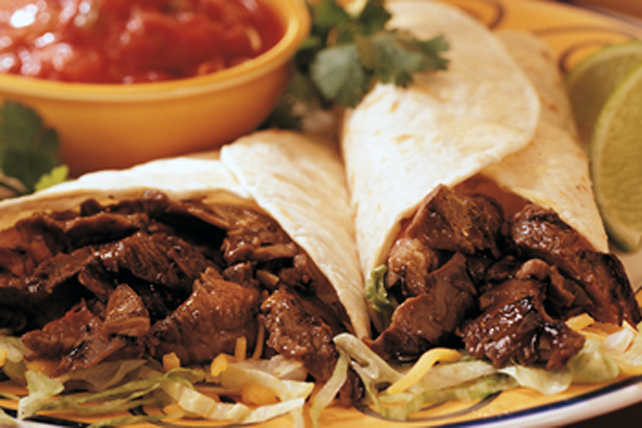 In addition to the lettuce and cheese, serve fajitas topped with salsa, sour cream and/or fresh cilantro. You can also set out fresh lime wedges to squeeze over the fajitas before serving. This flavourful grilled steak can be marinated up to 24 hours before grilling as directed.